Most people in these islands, if asked, would probably say that the crown of England goes from father to son (or failing a son, daughter) by strict right of blood. In all the tales that we as a nation tell about ourselves, it’s one of our least questioned stories. But maybe – for one rather prominent family, at least – it’s time to grow up, and put fairy stories away. Scientists in Leicester have just announced that the bones found in the car park there are indeed, by ‘overwhelming’ evidence, those of Richard III – but with a nasty little surprise thrown up by study of his DNA. Somewhere in the nineteen generations following down from Richard’s great great Edward III, there has clearly been infidelity. A child with no real right to their supposed father’s royalty. No problem, if the slip happened further down the family line – somewhere in the seventeenth or eighteenth centuries, say. And that has to be the statistical probability. But if it happened right back at the beginning – among people from whom our present royal family claim their descent – then do we have the wrong person sitting on the throne today? I don’t suppose they’re exactly quaking down at Buckingham Palace, despite the newspaper furore. 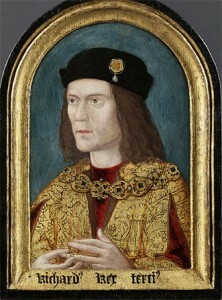 Henry VII, the first of the Tudors, claimed his throne not just by blood right, but by right of his Bosworth victory. What’s more, Henry VIII and his sisters – from whom came the Stuarts and all subsequent kings or queens of England – had two separate dollops of royal blood in their veins. One from that Tudor father Henry VII, and his Lancastrian descent from Edward III’s son John of Gaunt. One from their mother Elizabeth ‘of York’, whose family claimed descent from another of Edward’s son and also from a daughter. Which means Henry VIII and his sisters surely had some royal blood in their veins – unless Edward III’s wife Philippa of Hainault were a very racy lady! But that’s not the point, really. Point is, the succession has never truly been just a simple blood right story. And there’s always been healthy dose of practical pragmatism about the deal that brings us the British monarchy. When William the Conqueror’s sons left the succession unclear, matters were resolved by a kind of consensus. For the next few hundred years the Plantagenets managed a smooth-enough succession (what’s an enforced abdication or two among friends? ) and the eldest son of the eldest son would inherit, unless . . . But that ‘unless’ happened fairly frequently. And by Richard III’s day, the Wars of the Roses had already shown just how how fragile was the idea of an ‘indefeasible’ heredity. A century later, in 1688, the overwhelming voice of the country’s ruling class and ruling body decreed that the unpopular and Catholic James II should be replaced by his daughter Mary. A line had been crossed – though everyone was careful not to spell out the implications too precisely. When it was clear not only Mary but her sister Anne would die without a living child, it was Parliament’s voice that invited Anne’s third cousin, the Elector of Hanover, to become George I, ignoring fifty closer blood heirs. It was only then that smooth succession by right of primogeniture was at last assured. As if we could afford to forget all other considerations once it no longer mattered so much, once the monarch no longer really ruled the country. And even if we went back to the old rules, Queen Elizabeth II hasn’t much to fear, has she? She ticks all the ‘succession boxes’: blood right, Parliament’s approbation, the nation’s affection. But any subsequent monarchs – well, that just could be another story . . .